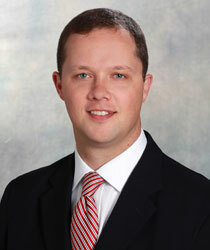 Jon R. Burns « James McElroy & Diehl, P.A. Jon Burns served for more than five years as an assistant district attorney in Iredell and Alexander counties before joining James, McElroy & Diehl. While there, he gained valuable litigation experience and worked hard to develop his trial advocacy skills. As lead counsel for the State, he achieved conviction after trial by jury in many different types of cases, including murder, theft, drug trafficking, methamphetamine manufacture and impaired driving. Raised in Charlotte, Jon received his Bachelor of Arts degree in Journalism and in Political Science from the University of North Carolina at Chapel Hill. Directly thereafter, he continued to live and work in Chapel Hill while he earned his Juris Doctor from the University of North Carolina School of Law. Since joining James, McElroy & Diehl, Jon’s practice focuses on family law, encompassing the issues of child custody, child support, spousal support (post separation support and alimony), equitable distribution and domestic violence. Experienced in all aspects of business transactions, Heath has represented acquirers and acquires in corporate mergers, acquisitions and reorganizations.